What is one of the first things you look at when researching a company online? It is probably reviews and testimonials. Potential customers want to know what other people have to say about their experiences with a brand. 70 percent of those who shop online trust recommendations, even from people they don’t know. If they do know the person, then that percentage rises to about 90 percent. Online testimonials build trust with your readers. They can easily see why others like your company and discover the exact reasons why. 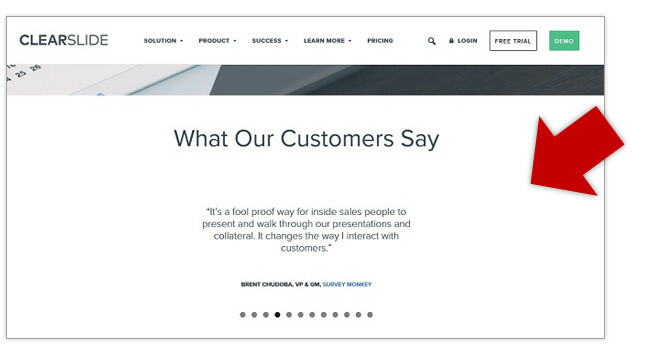 One company that does a great job building credibility through its online testimonials is ClearSlide. The company keeps it pretty straightforward, offering quotes from their customers in a slide that rotates through different testimonials. The testimonials themselves show the various features that these customers most appreciate and put a personal spin on what the service offers. Takeaway: When asking for testimonials, encourage your customers to explain what exactly they like about your product. Around 79 percent of Internet users over 18 use Facebook at least some of the time. Even if your target demographic is over 65, around 62 percent of adults in that age range who are online use that platform as well. Thanks to the popularity of Facebook, when users post a review of a product or service, others tend to see that post as authentic. While it would be possible to create a fake profile and make up a review, most companies know better than to participate in such underhanded tactics. Besides, when a real person posts a positive testimonial, you reach their friends and anyone their friends share the post with. 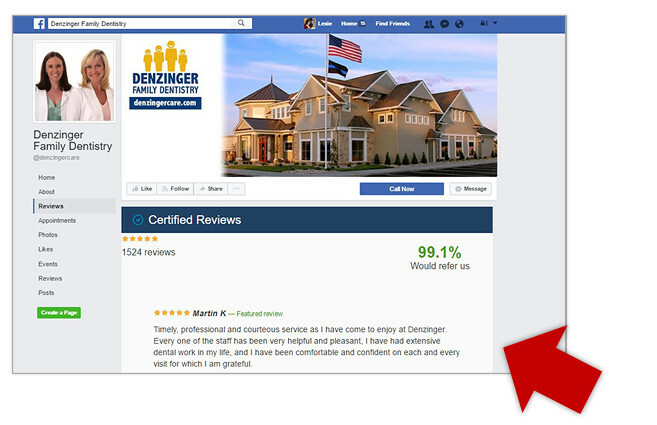 One example of a small business using social media effectively in regards to testimonials is Denzinger Family Dentistry in Indiana. This dentist sends out an email thanking customers and asks for their feedback on Facebook. Its Facebook page even has a dedicated Review tab. Takeaway: Ask your customers to review your product/services on social media and to tag you so you can screenshot and use on your website. Offering a dedicated page that simply states that the testimonials are from current or past customers is highly effective. 94 percent of business-to-business marketing experts feel testimonials from real customers is very effective and impacts buying decisions. 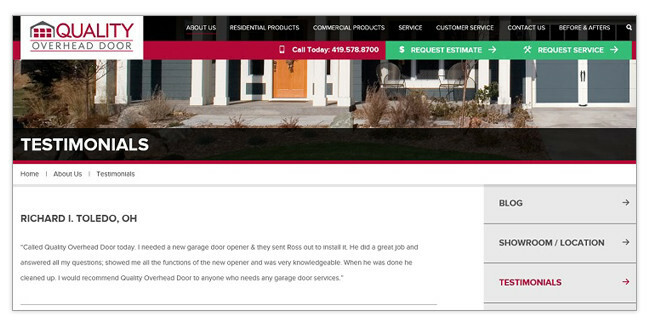 Quality Overhead Door offers a customer testimonials page that features the testimonial, the customer’s name and where the customer is from. Note the format of the testimonials. The customer explains why they called Quality Overhead Door. They then explain the problem they were facing and how the company exceeded their expectations. It is a formula that gives all the information a potential customer needs without being too wordy. Takeaway: When asking for testimonials, explain to your customers that you’d like the format to be similar to that explained above. Video testimonials are a nice addition to other forms of reviews you already utilize on your website and social media pages. In fact, studies show that video promotions are six times more effective than other online marketing or print advertising. One site that uses video testimonials effectively is ChowNow. The site features client stories on its testimonial page. These stories outline the features of the platform, how easy it is to use and life before and after the client started using the platform. Takeaway: Adding video testimonials adds another element of interest that can pull readers in and keep them on your page longer than if you didn’t offer videos. Out of the five most important tactics for business-to-business marketing, case studies and whitepapers rate right up there with in-person events, videos and webinars. Case studies offer an in-depth look at how the client was helped. One example of case studies that you can learn from is found on Optin Monster. 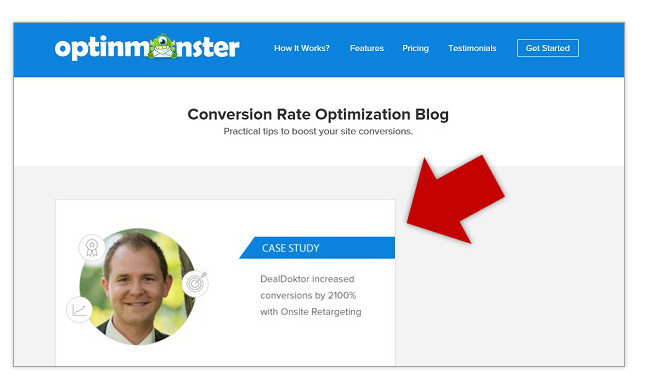 The client was DealDoktor and the case study outlines how OptinMonster helped the company increase conversions by 2,100 percent with a specific tactic. Takeaway: Reach potential customers by showing the successes of current customers. The idea is that the lead will wish to repeat the success of your other client and will retain your services. Traditionally, testimonials have been short and to the point, but there is something to be said for longer content as well. When consumers read a review written by someone else, about 88 percent of them trust it. That is why reviews posted to blogs are so effective. 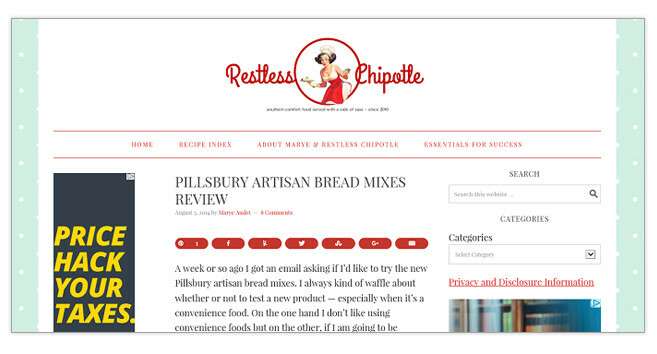 Restless Chipotle is a recipe blog. The author features recipes for making bread and Southern comfort food. She occasionally reviews products for companies. As mentioned before, this type of review can give companies a boost because the review is coming from someone the readers already read and trust. Takeaway: Seek out customers who love your product and are also bloggers and ask them to give an honest review. It is best to be upfront with readers and have the blogger explain that they received product in exchange for an honest review. Ultimately, you want to put only the best testimonials on your website. If a customer sends you a testimonial that says that you are just OK, you don’t want to feature that with potential customers. Instead, seek out praises from customers who have already praised you with a note or telephone call. You want to get feedback from those who adore you so you are presenting your company in the best light possible.